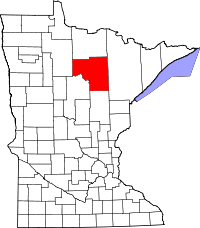 Itasca County, named after Lake Itasca which is located within the county borders and is the source of the Mississippi River, has the Court Recorder's office in Grand Rapids, the county seat and also the largest population center in the area. Among the office duties are indexing and distributing birth and marriage records, both of which are listed from 1891 to the present, and death records, which are listed from 1894 to the present. Property records, dated from the 1870s to the present, are also available at the Recorder's department. All applications to get copies of vital records are made available on the Recorder webpage, as well as all applicable fees. The Itasca Recorder also provides the Minnesota Official Marriage System for online viewing of marriage records. The Itasca County Historical Society also provides genealogy resources and a research center.